Groundwater extraction for rice cultivation has created a big problem for Punjab. Over time, water levels have dropped precipitously in the state. To deal with this it enacted the Punjab Preservation of Sub-Soil Water Act, 2009, which prohibits farmers from transplanting rice in fields before June 10 of each year, or close to the onset of the monsoons. Haryana already had this law. Farmers who defy the law are fined Rs 10,000 per hectare per month. The two states are already recording improvement in their water table. The downside is that the delay in planting rice results in delayed harvest, which leaves the farmer with little time to prepare the field for the next wheat crop. This is not all. Over the years, farming has become mechanised. Today, combine harvesters are used to cut paddy. This leaves straw and stubble on the ground. With the planting period between crops shortened, farmers need their fields quickly, so they burn the straw in the field. Satellite images of the period are stark: red dots of fire are seen across the plains of Punjab and Haryana. A study by the Haryana Space Application Centre, commissioned by the state pollution control board, found that between October and November 2013 over 20 per cent of the state’s paddy area—some 200,000 ha—was burnt. Now when the wind blows, the smoke, full of particles and other toxins, reaches the already polluted airshed of Delhi and its vicinity. People choke. We have thus set into motion a spiral of events that will have major health impacts. On the one hand, are the survival emissions of the paddy-wheat farmers and on the other hand, luxury emissions of the owners of private cars and diesel SUVs. All add to pollution. The airshed is not separated by class or region. So what can be done? It is important to note that the two farming states are doing their bit to control this fire. Haryana banned burning of rice straw a few years ago and has made it a cognizable offence under the Air Act. In 2014, Punjab followed suit. This is broadcast through mass media and in both states farmers have even been prosecuted for setting fire to their fields. This is more than what happens to polluting factories or diesel car owners. The real solution, however, lies in finding viable alternatives to the use of straw. This is where big opportunities lie. The fact is that rice straw is a resource; it can be used to generate renewable energy and, thus, reduce dependence on fossil fuels. Additionally, if straw is ploughed back into the soil, it will sequester organic carbon content in the soil, increasing its fertility and also storing carbon. More importantly, not burning straw will reduce black carbon emissions, which is a short-lived climate pollutant. Unlike carbon dioxide, black carbon does not have a long life in the atmosphere, but it is a potent greenhouse gas. Not releasing black carbon into the atmosphere will, therefore, bring quick climate benefits. Rice farmers in Punjab and Haryana can be big players in the climate change story. Alternatives exist and are being tried. Punjab, for instance, provides a higher tariff for energy generated from rice straw. As a result, it has set up some 200 MW of power plants that use straw. The big obstacle is to bale the rice straw to transport it to power plants. Currently, the state is providing a subsidy to farmers to procure balers to compress the residue but more support is required. Then there is farm equipment that can till the rice straw into the soil while simultaneously sowing wheat seeds. The Haryana and Punjab governments are providing subsidy on this equipment, but it is also insufficient. 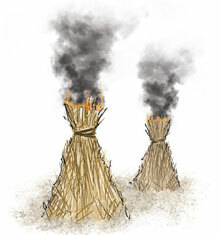 As a result, farmers continue to burn straw, pollute the air and damage health. It is time we took responsibility for these unintended consequences. One way would be to pay the rice farmers of Haryana and Punjab for providing the ecological and climate service of rice straw reuse. The payment should come partly from the people of Delhi and other cities who want clean air. The rest should come from carbon capture service. It would require the world to rethink the infamous carbon credits scheme so that for once it is the farmers and the poor who benefit. This way we all can win. The Green Revolution practice of high-response and resource intensive agriculture continues to haunt us. While the legislation preventing farmers from transplanting before June 10 has helped elevate the water table in the short and medium term, this must be accompanied by promotion of SRI method for rice cultivation so that production of rice can be made more sustainable. Reuse of the agricultural residues by ploughing it back into the soil is a much more sustainable option than trying to harvest it for energy production. The former will augment soil fertility by retaining the organic material in the soil and also help conserve soil moisture through buildup of soil organic material.